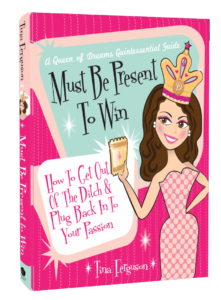 If you have slipped into the ditch and are feeling like, “What’s the point to life?” then grab a cup of coffee or tea and dive into Must Be Present to Win: How to Get Out of the Ditch and Plug Back In To Your Passion! Many years ago, I had slipped into the ditch myself. The thing is…I didn’t know it at the time! But, then, one-by-one a lot of people started showing up at my door…and as each one of them healed, so did I. This is not an ordinary ‘self-help’ book. It is literally brimming with every tool that was created over a multiple year period where I served others while re-plugging into my own passion. Most people don’t read it cover to cover, rather they flip it open and land on whatever they are looking for in the moment. This is NOT for you if you do not truly want change of some sort in your life! If you have a story, please send it to me…I would love to celebrate with you! One of the most powerful things you can do is let go of attachments. You can’t imagine how many attachments you have from the time you were born..from old loves to friendships to family to bosses and teachers to the barista who made your coffee this morning. Every day you are connecting to people. Imagine that all of these are connected to you and you to them. It’s hard to know how you feel when you are carrying around an entire army of people with you! Life is too short to allow energetic connections to rob you of all that ‘you’ are! This is perhaps the most powerful tool created in all the working sessions done with clients over the years. 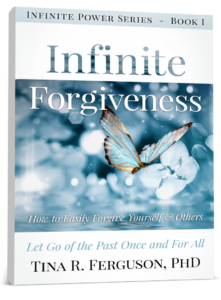 It is a simple, yet effective way to reset energy between yourself and another. Whether someone is angry with you, you are angry with them, whether it is heartbreak or even blinding rage, this simple tool can transform how you feel in just minutes. If the intensity of emotion is very strong, you may repeat this over a few days…but that is the longest duration. This is powerful! It’s non-denominational, it requires no ‘faith’ that it will work, and it does not rely on you ‘forgiving’ the person and letting them off the hook. It works on an impartial and neutral energetic level. And, it has been used by children and adults alike. Ready to try it? Just click on the image to the right! And, you can skip all the stories and go directly to the how-to. Yes, it really is that simple!